The last time Southern Maryland won a division championship was in 2009 while playing in the Liberty Division. 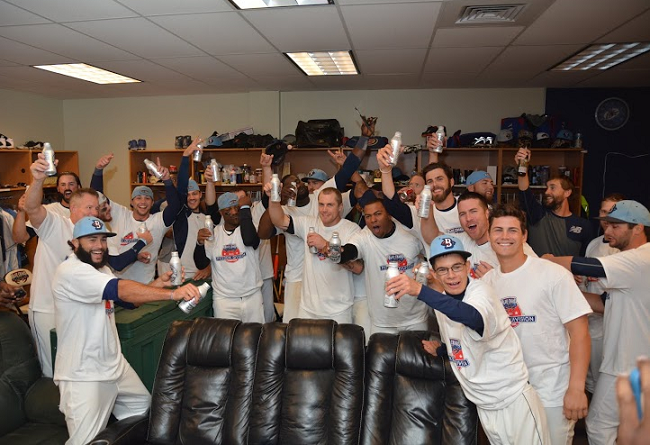 Fast forward to five seasons later and the 2015 Southern Maryland Blue Crabs are the Freedom Division champions after defeating the Lancaster Barnstormers 6-0, and winning the series 3-1. The big story of the ballgame was right handed pitcher Tim Sexton who threw a gem. Tim went seven and two thirds innings, allowing six hits, and striking out eight Lancaster hitters. At one point in the ballgame Sexton retired eight of nine. Southern Maryland got on the board early in the bottom of the second with a Keith Castillo sacrifice fly allowing Reggie Abercrombie to score to make it 1-0. In the bottom of the fourth, with runners at first and third, Fred Lewis came to bat and ripped a single into right center field allowing Casey Frawley to score to make it 2-0. In the bottom of the seventh the Blue Crabs put up four runs on the board. Zach Wilson would score on the Jamar Walton groundout. A couple of batter later and with runners at first and third, the captain Casey Frawley walked to the dish and drove a three run homerun over the wall in left to bring the score to 6-0 in favor of Southern Maryland. Lancaster managed to load the bases in the top of the eighth thus ending the night of Sexton. RHP Justin Berg came out of the bullpen though and struck out Brian Cavazos-Galves to end the threat for the Barnstormers. In the ninth inning with two outs, Berg struck out Tyler Bortnick to end the ballgame and send the Blue Crabs home as Freedom Division champs. Southern Maryland out-hit Lancaster 10-8 coming through with some timely hits. Keith Castillo also drove in two runs as well. The Blue Crabs will await the winner of the Liberty Division series between the Ducks and the Patriots. With the Freedom Division winning the All-Star game, Southern Maryland will have home field advantage with games three, four, and five being played at Regency Furniture Stadium. The first game of the championship series is set for Wednesday evening.